Its a new update by Blogger on its custom domain part. Some time ago here on MBT, you read 10+ Reasons Why you should buy a Custom Domain For Blogger. Having a custom domain have many advantages and would best suite you if you are serious about your blogging career and take it just not as a hobby but as a business. And for that you should be knowing What is Custom Blogger Domain and Blogger Subdomain? if you are interested in getting a domain through Blogger its self. To briefly explain, you can convert your blogspot domain name to a custom one like (yourdomainname.com) through Blogger, which is linked with Godady hosting service (which also provides domains). Though you can always use your own domain name that you have bought from any other domain registrar. So whats this post about? Before this new update came out, people (beginners) had problems in shifting over to custom domains besides dozen of tutorials online. Thats natural as its always tricky for the first time. CName and AName records often confused people. Many had problems in settings out DNS settings for their domains. So now, Godady (which is linked with Google Blogger, as i mentioned before) has launched a new tool by which GoDady users (who bought domain directly from Blogger) would be able to set DNS settings with a single click of a button. The entire process is really simplified. If you don't already have bought a domain from Godaddy then I really recommend that you get a dot com domain from Godaddy for your blogger blog for just $7.49 per year far cheaper than $10 by Blogger. Once you have bought a domain through GoDady then go to your account domain settings tool and type in your domain name (like example.com or blog.example.com) into the box like shown below. Thats it. All of your DNS settings for domain would be up and running. Wait approximately 30 minutes and then type in your same domain name into Blogger Domain settings i.e Settings >> Publishing. Great information and well written.thanx for sharing. But I love Bigrock services because they offer us to offline payment. 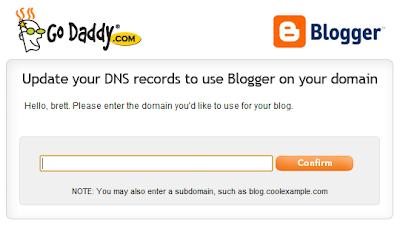 You are correct, it has become very easy for setting blogger with godaddy. $7.49 per year ! isn't it? Thanks buddy. I agree many people prefer offline paymeent methods like myself. Glad that it helped you. Godady have really cheap rates but many people often decline it as an option due to credit card payment mehtod. Many dont have it. And now its even more easy with this new tool. Thanks for stopping by. I can update my domain after the 1 year without changing, cost and domain..?? Its not much of a problem even if you don't have a credit card. There would be so many local web hosts and domain registrars. You could always use them to get a domain, which would allow offline methods too like bank deposit etc. I personally didn't had a credit card so i had to get the domain for my blog from a local host. Yeh without any problem. You could always renew your domain registration before its getting expired. The renewing option is available in your host profile settings. can my all blogspot traffic redirected as blogger have facility so i never lose my visitors traffic right now i have thousands of visit per day on my blog in that case it is wise to switch domain ? i'm already take domine from name.com..
well i need some help from you. I have changed my blog from greatcelebrityfashion.blogspot.com to www.greatcelebrityfashion.com. but my blogs rank was 2 and alexa links were 126. but when i transfered it to domain. its rank is 0 and no alexa data...Why.? and how to solve it....please help me. Nice POst. I feel the custom domain will reduce the traffic for short period of time. That's my experience. is your 'mybloggertricks.com' hosted on google's blogger? Hello brother, I am having an issue on blogger about the custom domain, so thought that you can walk me through... You can check the issue here (http://productforums.google.com/forum/#!category-topic/blogger/something-is-broken/_MelmyjXwwI).. Please do help me as I have not yet found a fix to this problem..
Then ads are not showing in custom domain.But if I cancel the redirect and use the blogger default url it showing the ads. In add-sense account the this site is already included as my owned site and I already added the code in my site and waited for already two weeks.Still ads are not showing. I just want to ask you sir , is your blog made on blogger or wordpress. do you get ads in subdomain in blogger from google.as you told we must switch to custom domain after 6 months does there be any loss of traffic. Kindly send me the detailed analysis of this post and my query. I hope you would share your expert comments as soon as possible. In order to help me out. I will be waiting for your reply Sir.